It’s been a long few months. I am in unchartered territory here due to the temperature issues I encountered. 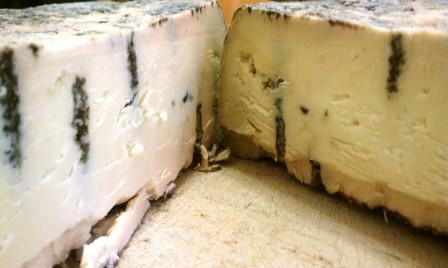 A blue normally takes 3-5 months in order to age properly. If you have followed my other blue cheese updates (you can see my initial post and picture here) you know that I had to age this longer than normal due to the colder temperature. I decided to bite the bullet and crack it. Without rhyme or reason to this decision other than a hunch, I pulled the wheel out of the fridge, unwrapped the wheel from the foil, and took a look for the first time. The aroma coming off of this hit me square in the face. It smells like a foot… That’s right. A foot in the middle of a dank and dark cellar filled with musty sacks and hay. Unbelievably strong and unbelievably awesome. I love the look of the crusted wheel with orange and brown streaks interspersed with blue and green. Definitely needs a scrape, but pretty cool to look at. I actually held my breath as I began to cut through the middle of the wheel with my knife. Great density and moisture. “Fudgy” is overused quite a bit when describing cheese, but in some cases (such as this) I find it appropriate. A cheese wire would have been ideal here as they are best used for creamy cheeses that have a tendency to stick to things (like knives with wide blades). I didn’t know what to expect in regards to the veining. I poked several holes throughout the wheel from top to bottom as well as side to side to create maximum veining potential. 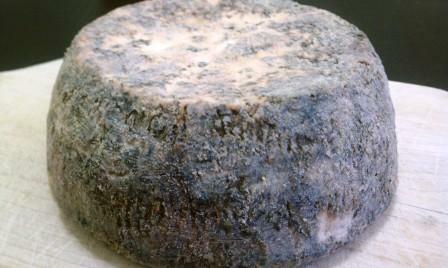 The blue mold “activates” during the aging process once exposed to air. By poking holes deep into the wheels with a sterilized tool (such as an ice pick), the mold propagates within and grows along the channels created. The veining is not as extensive as I anticipated, but there is even distribution to where I am definitely satisfied. Pretty cool. All right. I have to admit that I hesitated before taking a bite. Why? Well…look at it. I made this…at home…in my kitchen. Every time I encounter mold in my fridge, I usually throw the offending object into the garbage. I say “usually,” as there are obvious exceptions. This time, I encouraged the mold to grow. This is what I wanted, but I haven’t done this before. So before that first bite, I hesitated for approximately .001 seconds. I am still smiling even as I write this. This might be the best cheese that I have made. I have said that a couple of times so I can only hope that as I continue to learn and refine my technique, this tells me that I am getting better. This is a strong cheese and not for the faint at heart. The clean flavor of the milk is not overpowered at all (love the milk from Tonjes Farm Dairy). With the earthy broth-like quality and touch of fruity acidity on the end, there is a balance here that I don’t think I have achieved before. In talking about cheese tasting, there is a 6th taste or “umami” that some people mention when looking for descriptors. It isn’t anything that you can necessarily put your finger on, but an indescribable quality that continues to tempt the palate. This is the closest that I have come to creating something that embodies that characteristic. My recent experience with Point Reyes has inspired me to follow a similar process. I am going to ask some cohorts of mine to taste this cheese, write down their thoughts, and then report back. Maybe have a couple of people guest blog? As much as I would like to maintain objectivity, I think I have reached a point to where I need to extend beyond my comfort level in order to improve.